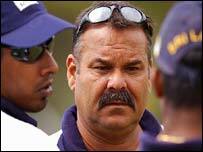 Bangladesh have turned to Sri Lanka coach Dav Whatmore in an attempt to turn around their woeful international form. Whatmore will join the Tigers once his current contract expires in May. The Colombo-born former Australia Test batsman was informed by the Sri Lankan authorities last month that his deal would not be renewed. And BBC Sport understands he entered discussions with the Bangladesh Cricket Board (BCB) almost immediately. Whatmore will be the seventh Bangladesh coach since 1990. "The job is very challenging and I have decided to accept it," Whatmore said. "I will be starting work in Bangladesh from June, and I am looking forward to it. Whatmore, who led Sri Lanka to victory in the 1996 World Cup, had been linked to a vacant post at India's national academy. "There were other offers, but I decided to take the one from Bangladesh," he went on. "I know Bangladesh has some good players. What they need to get is more confidence, the feeling that they can win Test matches," Whatmore said. Pakistani Mohsin Kamal was dismissed after a winless World Cup campaign. Interim man Sarwar Imran took the reigns for the current home triangular series against India and South Africa, and the two Tests that follow. Whatmore's first assignment will be Bangladesh's tour to Australia - for whom he made seven Test appearances - in July. Granted Test status in 2001, Bangladesh have avoided defeat in just one of their 17 Tests - a washout against Zimbabwe. And last week they recorded a 40th consecutive match without a win, failing to reach the final of the Dhaka tournament.